Thirsty? We offer you free delicious tap water. Since our Amsterdam tapwater is top quality, we would not import plastic bottles with normal water from far away countries. 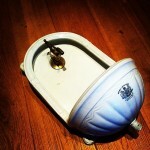 Use our antique fountain to stay hydrated!